I love to cook and bake from scratch as much as I can. There is something very satisfying about seeing all your hard work nicely presented on a plate. However, with two very active and growing boys there are some days that just getting any meal on the table is a struggle, much less something elaborate or complex. This is particularly a problem with breakfast. I would love to be one of those people that pops out of bed and makes cinnamon rolls before anyone else wakes-up. I'm not one of those people. My mornings start with me dragging myself out of bed at 530 to make my husbands lunch and enjoy maybe a half hour of peace before one of my kids decides to wake-up and demand food. This is quickly followed by dogs needing to be taken out, a pile of dishes to be washed and general morning craziness. All of this is before I even get to make my first cup of coffee. Due to this morning insanity I have learned that quicker is better in regards to breakfast. I still prefer to try to make breakfast at least partially from scratch, so I have found ways to cut corners in the morning. 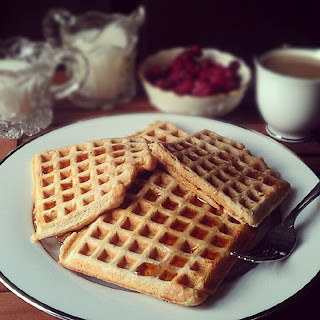 I stumbled upon a great recipe for Soul-Satisfying Oatmeal Waffles from Taste of Home Magazine, which uses packaged maple brown sugar oatmeal packets to save time. This recipe has 10 ingredients. It takes 25 minutes start to finish and makes 10 waffles. I made a few modifications. Instead of 2% milk I used the organic non-fat milk I already had in the fridge. I didn't notice that the taste was any less rich making this substitution. Additionally, I chose to leave out the chopped pecans. My two boys aren't big fans of nuts in most recipes, so I let them out completely. For the oatmeal I already had maple and brown sugar packets in my pantry cupboard, so that was the flavor I used. I would assume this recipe would work with a variety of oatmeal flavors, there could be a number of great combinations! I followed the remainder of the recipe as written. I love how easy this recipe is to make and that is uses instant oatmeal packets to save time. I seem to always have oatmeal packets leftover from when my mother-in-law goes shopping and this was a great way to use them. My two boys really loved the taste and I was happy that breakfast literally only took minutes to prepare. A very easy recipe that is great for busy weekday breakfasts. This sounds AWESOME! I'm not "one of those people that pops out of bed and makes cinnamon rolls before anyone else wakes-up" either!! Haha! I think they only exist in television and only to make us humans feel guilty about not doing it all! I agree that they only exist on television :) Glad to know someone else is like me in the morning! Tell me what you think of the recipe if you try it! Yummy! newest FB follower!found you through blog hop! !Would love for you to follow back!? They were yummy! Going to follow you back now! Oh my, these sound delicious!! Thanks for following back :) I hope you come back again soon!